Boise's Urban Wildlife is located on 9th Street between Main and Idaho Streets in Boise, ID. 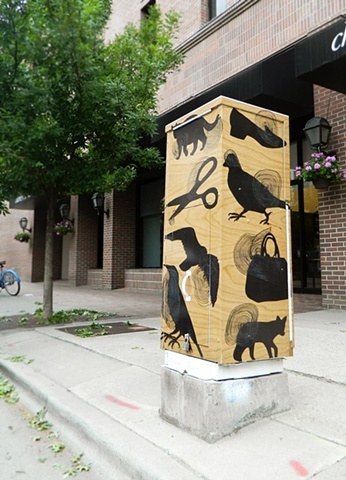 This artwork references the human and animal inhabitants of downtown Boise, ID. The animals and birds selected represent common and rare species that reside in or pass through our urban core including the coyote, mountain lion, starling, pigeon, and peregrine falcon. They are shown in silhouette for identification as in an urban field guide. A series of common objects reference the human inhabitants (residents, visitors, and businesses) of downtown Boise. The original artwork is an ink drawing on wood veneer.